Self service laundromats have not been made redundant by the proliferation of domestic washing machines, quite the contrary! Learn how to open a self service laundromat. The success of the Speed ​​Queen concept in Europe, Asia and Latin America indicates that demand is growing and varied: students, pensioners, managers and families use our laundries all year round. Self service laundromats were first seen in the 1970s. In general, they are located in busy shopping streets or near university areas. Since the launch of the Speed ​​Queen laundry concept in 2014, ever more self service laundromats are opening. There are two factors behind this success: constant demand and Speed ​​Queen expertise. Find out why the laundry market is booming. Speed ​​Queen’s experts guide the investor through every step of the process: choosing a location, developing a business plan, selecting machines and equipment, installing and furnishing the laundromat. 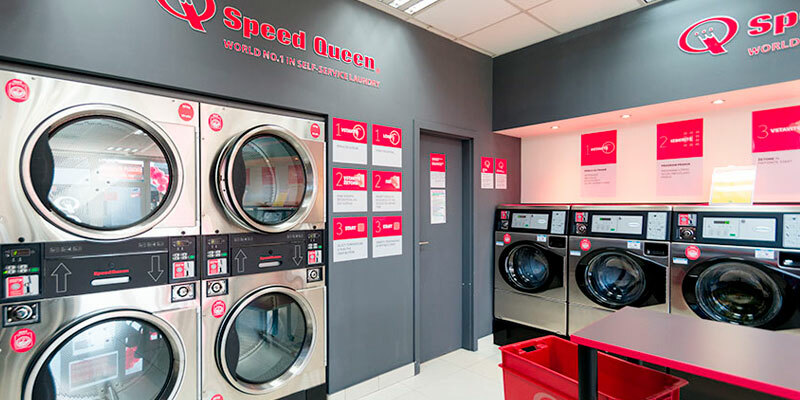 Discover the main steps in opening a Speed ​​Queen self service laundromat. Speed Queen is the only brand to equip its self service laundromats with its own machines. So, you can count on a 100% Speed ​​Queen service, a real advantage, especially since Speed ​​Queen has been making washing machines for over 100 years. Discover how we help you to open your own business.